Moths have an unusual weapon for escaping hungry bats, according to a new study. Their long wing tails help disrupt the bats’ echolocation capabilities, making it less likely that the moths will get eaten. The study, published in the Journal of the Acoustical Society of America, doesn’t put forth an entirely new theory, but this is the first time there has been rigorous evidence to support it, and the researchers were able to refine their knowledge of how exactly the acoustic trick works. 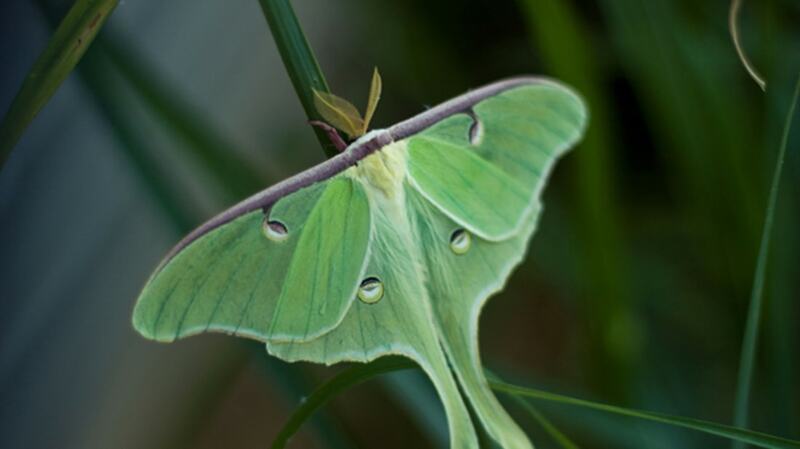 Actias luna, the luna moth, has big, greenish wings that taper off into long tassel-like hindwing tails. Scientists from Johns Hopkins University used high-speed 3D video and sonar processing to figure out just what effect the moths' long tails have on sonar signals like the ones used by bats. They found that the tails do impact sonar—but not in quite the way they expected. The moths' bodies and large wings have a greater impact on the sonar signals that bats receive back during echolocation than the thinner tails do. However, the luna moth’s tails are twisted—and this is where the advantage lies. The shape of the luna moth’s tails create echoes that bounce in every direction, possibly disrupting a bat’s sonar tracking of the insect. If the hindwing tails are absent, the bat sonar produces an echo signal directly on the center of the moth, which would allow a bat to easily find and capture its prey. But the echoes created by the tail can shift the echo away from the moth’s body, making it more likely that a bat would attack the wrong place and miss the moth. The researchers found that the tails caused the echo center to move past the moth’s abdomen 53 percent of the time—not a sure bet, but certainly a boost for the moth’s survival chances. "If the bat always aims for the highest-amplitude echoes, there’s a very small percentage of the time that the tail echoes would be dominant," lead author Wu-Jung Lee, who has since moved on to the University of Washington’s physics department, said in a press statement. "But maybe by displacing the echo center, that can do the trick." The researchers in this study used an experimental chirp system to study the echoes produced by the moths, so their data might not exactly translate to the real world. A bat’s sonar might echo a little differently than the imitation in the lab. But this still provides compelling evidence for why luna moths might have developed their tails.